Every single time we had a good shot, people were in it! Probably wasn't the best idea to go there at lunchtime..
We wish you all an awesome evening! You girls are both so adorable! I love the military jacket and pink shrug! so nice! would love to visit zurich! omg this fur is amazing!!! i follow you !! Hi I like so much your blog, you have amazing style! u guys look amazing!! loving that pink fur bollero.. It looks like you two had a nice lunch stroll. I love the pink fur! And thanks for visiting my blog, dear. this post is incredible as the last I saw! stay that way!! the fur jacket is stunning ! love Zurich so chic---wonderful chic shops ! ...and tomorrow Basel !!!!! yuppy !! Hey girls! Thanks for visiting my blog. Great photos. I really like the faux fur vest. You two are very cute! Thanks for the stop by on the blog. Both of you have an amazing style and sence of taste to my mind)Great pictures as well! I'm following you right now, hope you will do same! These are all great pictures. You both have amazing style too! 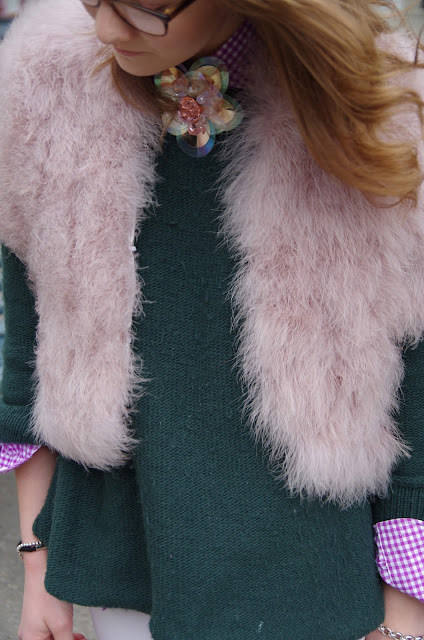 I love the pink fur - it is so chic and girly. I also love the army print shirt :) Lovely blog ladies! Love both of your jackets! Where is the feather one from? I almost bought that camo one at Zara, so cute! love the outfits both of you guys paired! Nice blog ! I love the black&white shirt ! u both have a really nice and original style! Great look, i love your shoes ! You ladies are cute. Great outfits! Amazing pics!! :) I really love your outfits!! So cool! p.s. thank you for your comment and for following me!! I follow you back with GFC and bloglovin!! Love both looks!! I think I need a windowpane blouse! Your outfits are so cute! Thanks for checking out my blog! love the looks! the fur coat is awesome! Love the fluffy jacket ! I love your outfits, they are so different but are stylish! And thanks for your comment on the blog! totally loving the coat so pretty! very nice!! I'm also a new follower. Would be great if you could visit my blog and hopefully follow me back too? Thank you for come to our blog. This is so good! Love your style - Thumbs up for you two!